Somewhere along that road less traveled, I bumped into someone I wish to spend the rest of this journey with. Happily ever after is not a guarantee on this new path I chose, but I promise to hold his hand, through ups and downs, from now until ever after. This blog has been silent for a while because I have been more active with my multiply site. As I live with the walking evidences everyday, e.g. slim and beautiful skinned women and even men, healthy oldies (heck, my manager who is past his 60 is still active in the business and even monkey-business and his menopause-d wife is even healthier than my mother who haven't reached that stage yet), I couldn't help but believe that their tea-drinking habit is the key to their health and beauty secret. I hardly see the Japanese drink plain water, they usually quench their thirst or pair their meals with a cup of green tea or the brown-colored Oolong tea. It's even easier to find an Oolong tea container than a normal water jug or "pitsel" from the hundred yen shop. Green tea is popular around the world but Oolong is the household tea here. They serve it in restaurants, fast foods for free. Even in anime, you see the characters drinking a glass of brown water. These are what triggered my curiosity with Oolong-cha. The taste is kinda weird but I'd love to give this tea a chance in our daily diet. I was about to buy a pack but because it's not as cheap as the green tea because it always comes in at least 30 bags (no trial pack). I figured I had to research about more about its health benefits and see if it's worth it. Scientists from Japan's University of Tokushima School of Medicine found that people who regularly consumed oolong tea experienced more than twice the calorie-burning results compared to those who drank green tea. A study published in the Journal of Medical Investigation found that women who consumed wu-long tea directly after a meal increased energy expenditure by 10%. This compared to an energy expenditure of 4% for green tea drinkers and 0 for water drinkers. Researchers at the Suntory Research Center in Osaka, Japan found that drinking wu long tea 15 minutes before eating foods high in carbohydrates curbed rises in insulin, thus reducing some of the fattening effects of carbohydrate intake. Researchers from Japan's Shiga University of Medical Science found that drinking wu long each day helps to clear up skin problems within one month. Dr. Kenichi Yanagimoto and colleagues from the University of California found that people who drank wu long tea on a daily basis experienced a fifty-percent reduction in free radicals within 15 days. Free radicals are damaging substances in the body that contribute to signs of aging, including wrinkles and dark spots that are caused by ultra-violet rays, chemical food additives, pollution and stress. According to a study published in Antioxidants & Redox Signaling, test subjects who consumed wu long were found to have stronger immune systems and a reduced risk for infections. I guess I have to start filling my pink Oolong jug not just with water but with a bag of this promising tea. I had a craving for Sbarro Baked Ziti, but since it's impossible to find that here, I wanted to make anything Penne. I have a Penne Pasta, my friends left me with fresh tomatoes from the last party and I have a bag of Mozarella Cheese, what to do? So after searching the net I found this recipe which originally requires baking but because I don't have an oven, I used the oven toaster instead. My camera phone ran out of battery so I wasn't able to take a picture of it, also I thought it would come out just okay and not worth blogging about. But I was wrong, it turned out delicious and if I just added more mozarella cheese and salt, it would have came very, very close to baked ziti. I now love toasted mozarella cheese. Even reminded me of Pizza Hut... yum, yum. Again here's something vegetarian for a change, and fitting for the lenten season. It's so, so easy pa I swear! If you're using fresh tomato, the first step is making the tomato sauce. In a heated casserole, put in the sliced tomato, mix it, flatten the tomato cubes, put 2 tablespoons of water and the sugar, when you think the tomato has been juiced out, meaning there are more juices and less tomato cubes, set it aside. Cook the Penne Pasta like any pasta. Heat vegetable oil, or any cooking oil, saute the onion and garlic. Pour in the tomato sauce, and add the oregano, adjust the taste with salt and pepper. Then simmer. Turn off the fire, add in some of the mozarella cheese. Mix it with the cooked Penne Pasta. Put it in an aluminum plate or bowl and put the rest of the mozarella cheese on top. Place inside the oven toaster and heat it for 7 minutes. If you're a cheese addict, you can sprinkle it with parmesan cheese upon serving or eating. I'm in search for light meals that doesn't require pork or beef in accordance to this season of lent. 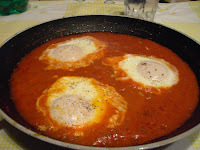 I found this Egg in Tomato Sauce recipe which is just perfect. I tried it, it tastes goood but because I have no talent in cooking eggs in any style(they just manage to appear ugly), I opted to post the pic from the blog where I got the recipe instead. I followed the recipe (saute garlic, put the tomato sauce and the rest of the seasonings, then break the egg) but I made changes with the ingredients because some are not available here. Try it for your breakfast, or light dinner... i now love the taste of egg and tomatoes together! Because it's just impossible to satisfy my hubby with just an egg for dinner, especially when he only had bread for lunch (yeah bad wife), I made him Buffalo Wings which I just discovered is easy to make. 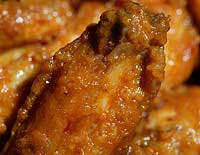 Yes it's the same buffalo wings we enjoy at Don Hen's or Hooters in Singapore. Mild: Use 3/4 cup butter and 1/4 cup hot sauce. Hot: Use 1/4 cup butter and 3/4 cup hot sauce. completely coat the chicken with the breading. I called the Salon to make a weekend appointment for haircut and hair color, then I realized my dry scalp also badly needs of moisture so I added hot oil. Since I'm already at it I figured to just do a complete overhaul with a facial, manicure and pedicure. So there, I was slated for an early 10 am appointment for the next day, it's rather early but I have to make it on time if I am serious about beautifying myself, you know how strict Japanese are with appointments. But alas! the following day I woke up at 11 am... I was so so late! Before I could grab my phone to take my chance on my appointment, I realized it's just a dream, heck I can't even speak nihonggo to make that appointment! And of course, I don't have that money to waste for those kind of services. I guess my subconscious is missing my regular salon visits back home, as well as my aching ingrown toe nails. How I miss our condo in MET where my favorite salon was just in the ground floor. For only P100 I could just ask Bong, the stylist to blow dry my hair straight if I just feel like having a straight hair for the day. He is also the best colorist I know coz hindi "nangangalawang" yung color even if 4 months have passed when I had it done. I have been wanting to grow my hair long but I didn't realize it's so hard to maintain a very, very curly long hair without the help of those trims and hot oil treatments. I didn't even bring my ever reliable virgin coconut oil! Every day, it takes at least 10 minutes to untangle every strand and now, I can't sleep without the hair clamp Rose gave me because I had to tie it up while sleeping or else that 10 minutes will become 30 minutes just for the hair alone. I love my hair now, but I think I have to give it up. Not that I'll go bald, but I am thinking of having my hair shorter for easier maintenance. I wonder if these styles will work for me, hehe. the box says "Please enjoy our taste! ", oh I surely did!! Let me share to you the most delicious egg tart i've ever tasted. 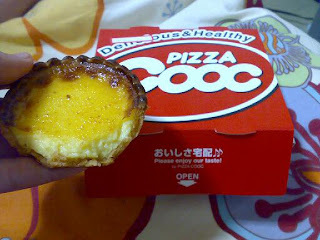 We were ordering Cooc pizza for dinner when I saw the egg tarts on the brochure, it's been a while since I had one so I ordered a box. It costs Y299 (113 php) for two small rounds but it was definitely worth it! It was still warm when it arrived which lasted even after we have finished the pizza. The crust is like a soft biscuit, it's crunchy but you won't be afraid to lose a teeth when you bite it like the normal pie/tart crusts I have eaten. It breaks on your first bite and the egg filling practically melts in your mouth that you don't need to chew it. The caramel on top gives that sweet after taste. To give a better picture, it is an egg tart that tastes so much like a creme brulee. I was very, very shy and anti-social back in gradeschool and because of that I only made 1 bestfriend then. She was rowdy, tactless and "burara"(which is why after 5 yrs the boys in our batch got the shock of their lives when she was crowned Mutya ng Dabaw), very opposite from my passive persona which I forgot how we were able to bond, but we managed. And she is the longest/oldest (how would you describe that) friend I have. Her being studious influenced me to do better in school. I think I have never studied harder in my entire life. We even spent our recess and lunch breaks at the library studying. Ever since I made friends with her, I became consistently in honor roll and graduated in top ten. We never competed with each other, however there's this girl she wanted so badly to beat. This girl is our top 1 and she gets upset whenever she slips in her race. When I asked her why she couldn't be happy with her top 2 spot, she answered that because her dad promised to stop drinking if she was able to land on class' top 1. See, her dad couldn't make a day pass without at least a bottle of beer. He wasn't a bum or a drunkard, he is actually a doctor and a very good father. As a child who descended from a family of doctors(her mother is also a doctor), she knew very well that this is bad for her father's health. While I enjoy the P10 my grandfather pays me per honor certificate, her efforts are all for a more serious cause. There was a time that I wanted to ask miss top 1 to study less and let my bestfriend go ahead, or maybe I asked her that and she just smiled at me. I forgot. Well anyways, my bestfriend still failed to land on that precious spot. Last Sunday night, my brother broke the bad news, my bestfriend's father died of liver problem probably all those alchohol took its toll. It was said to be sudden, one day he just went in coma then died the next day. And these memories loomed over my head when I heard about it. The last time I talked to tito was during my wedding preparations when I went to their house to look for my friend. And he gave me pointers about marriage. Well, you never really know.